Modified Bitumen (MB) roofing is an asphalt-based, close cousin of the Built up Roof (BUR) designed for buildings with low-slope or “flat” roof structures. This roofing system originated in Europe but began being used successfully in the United States back in the mid 70’s. With five layers of protection, Modified Bitumen Roofing Systems are designed to withstand extreme environmental elements. Modified Bitumen replaced the older Asphalt and Gravel roofing systems of the 60’s and early 70’s because with those other roofs it was very difficult to create a proper seal at all seams and connection points. Those types of roofs failed early in their lifespan, causing leaks and required much more maintenance. 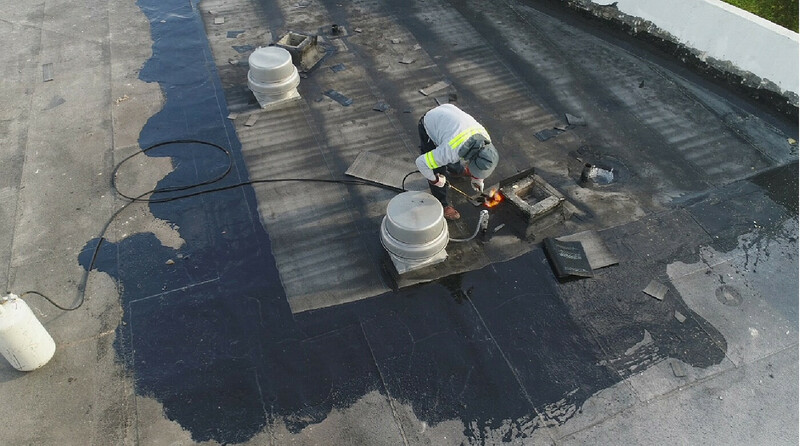 As the Modified Bitumen Roofing System is made from asphalt and a variety of rubber modifiers and solvents that allow strong seals at all connection points and seams. There are two ways to apply this roofing system. The heat application process is where the seams are heated to melt the asphalt together and create a seal. There is also hot-mopped application, similar to how conventional built-up roofs are installed. In the cold application adhesives and self-adhesive membranes are utilized. Another benefit of Modified Bitumen membrane roofing systems is that they contain materials that resist expansion and contraction, as well as reflect much of the UV rays. Since the Modified Bitumen roofing membranes either lack seams or have strong seams, what expansion and contraction does occur does not create leaks and breaks at these seams. These newer roofing systems are also attached directly to the top of a building, which eliminates the need for excess weight above. The Modified Bitumen Roofing System is one of the most trusted flat roofing systems in the industry today. The framework for Modified Bitumen Roofing Systems is a five-layer combination of roofing components.